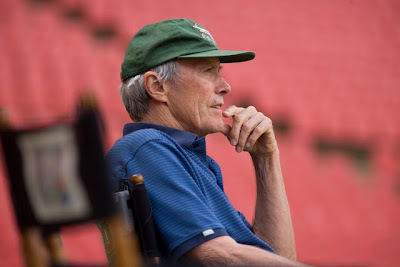 Although it is most definitely a film from director Clint Eastwood, other than its themes of an unlikely alliance between two very different men and a firm footing in the realm of equality and social consciousness, there is very little about Invictus that feels like a Clint Eastwood picture. While in the case of another unexpected true story, Letters from Iwo Jima, the Eastwood touch behind the camera proved as vital as it is when he gets behind the piano to compose the scores for his movies like Mystic River and Million Dollar Baby, when it comes to Invictus, everything just feels so protracted and overly orchestrated that we miss his particular brand of jazz inspired chamber pieces all the more. Gone are the moments of free play from actors at the top of their game, hitting us on a visceral gut-level as evidenced in River as instead they're replaced by forced speeches that don't carry the same magic we've come to expect from the multiple Oscar winning filmmaker. 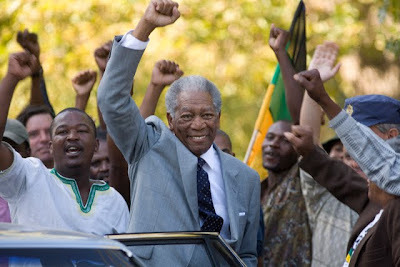 To this end, it's important to note that although Invictus is a film by Clint Eastwood, it is not one that was shaped by the man as it was instead developed by his friend and frequent collaborator, Invictus's executive producer and star Morgan Freeman who portrays Nelson Mandela in this little known chapter of the South African President's life. Opening just after Mandela is released following his 27 year imprisonment from his efforts against Apartheid as he eventually becomes the elected president of his homeland, Invictus, which takes its name from William Ernest Henley's inspirational poem, centers on Mandela's efforts to use “sport” to unite the new rainbow nation. Reaching out to the country's Springboks rugby team captain Francois Pienaar (Matt Damon), Mandela encourages the down-on-their-luck team to not just play defense when they host the World Cup in 1995 but rather win the games on their march to the final event. And shortly after Mandela invites Pienaar for tea, he lays out the strategy to put this plan in action via a goodwill effort that takes the team on a unification journey to win over the young black African citizens who normally associate the team with their former oppressors. Caught between its role as a political film and a traditional underdog sports movie in a strange, unequal balance between the two which leaves both plots weak throughout, Invictus manages to strike a chord as an inspirational work but not enough to stand out when you consider just how many other sports films take on the same material in a superior fashion year in and year out. Going for some of the obvious shots of people coming together in a few painfully forced scenes set during the exciting World Cup match, this overly long and roughly average work boasts fine turns from Oscar nominated leads Freeman and Damon but when you compare it to works that are not only in the same genre but also throughout Eastwood's career, there's no doubt that you'll be left disappointed. While the gorgeous Blu-ray manages to capture the theatrical transfer very well, delivering a top-notch sound balance as the fans in the stadium roar from behind you in the back speakers as it puts you right on the field with Pienaar, overall, Invictus is arguably one of the filmmaker's weakest movies in a decade of outstanding direction. And although you may be thrilled with the picture-in-picture making-of Blu-ray exclusives and featurettes, the film is one where a single viewing is more than enough for this reviewer when it comes to deciding whether or not you'd want to add Invictus to your high definition library.